AstroPlanner is a complete system for tracking observations and planning out nightly viewing or imaging sessions with your equipment. It also offers computer scope control from within the application. Upon launching the software you'll need to start populating it with your user information. You'll provide your observing locations, this can contain your current location, as well as offsite locations that you visit for observing. AstroPlanner can access a USB GPS device to give you pinpoint accuracy for your site location. This should allow you to plan for those remote visits before you travel, so that you can be prepared with the equipment you require for the objects you plan on viewing or imaging. The filter resource. (Add your filters here on this tab, and AstroPlanner will show you the visible wavelengths your an view or image with. In addition to your location, you can add each telescope you own, any eye pieces you have, optical aids like Barlows or reducers, camera or viewing filters, the observer (yourself or a buddy who might observe with you), and any cameras you might utilize for imaging. Once you've added all your equipment, you can start to add objects to the observing list. There are four primary tabs for objects. The objects list, the observations tab to add observations, the field of view tab which shows you how your image will look using the selected equipment, and finally the sky tab which shows the nights sky chart and allows you to view where the object you selected lies in the night sky, as well as other objects that are visible. 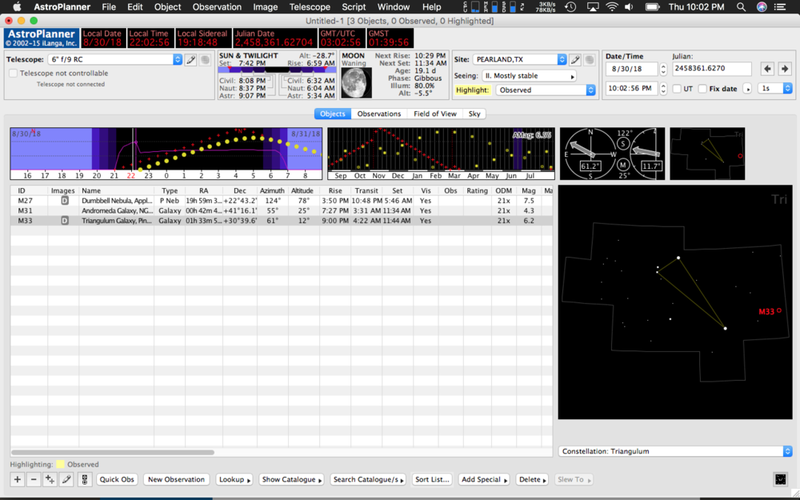 This is the main view within AstroPlanner. From here you add objects by using the Plus symbol in the lower left corner fo the screen. You get a search function to find the object and add it to the list. You an also browse by what is visible currently in the sky, and filter those choices by object type (open cluster, galaxy, nebula, planetary nebula, etc.). Across the top of your screen, you get a readout for the current date and time, sidereal time, Julian date, GMT, and GMST. On the second row below that information you can select the telescope you intend to view your object with. Next to that, you can see the sun and twilight time, what the current moon looks like, as it's helpful to know how much of an impact the brightness of the moon will have with imaging. Then next to that is your site location, and a clock which you can set to show the object at different time intervals. On the next row of information you see the ephemeris of the object during the night and month. This allows you to see the objects elevation during the darkest part of the night between sundown and sunrise and it's visibility over the month. Next you see see altitude and azimuth indicators from due north. This gives you an idea of how you will need to point your telescope to see the object, in the above image it's indicating you need to point east and slightly above the horizon. Lastly there is a tiny indicator of where the object is in the night sky. At the bottom of the screen you see your object list, as well as the local sky chart (showing the object constellation where your object is. You can switch the sky constellation chart to show images from several astronomical databases like the Hubble Space Telescope raw images. This tab highlights observations for the currently selected object. From here you can put in seeing and transparency conditions, note your field of view, and add any observations you made of the object during this particular time and date. Additionally, you can add attachments to your observations. In this case, I added an image I took with my telescope of NGC7000. I left an observation note listing out the focal length and equipment I used for this session. This tab allows you to select all of your equipment for the viewing session. In this particular instance you can see I picked the AT6RC scope, with a CCDT67 reducer, and the TeleVue Delos 4.5 eye piece. With the current object M33 selected, and a Hubble Space Telescope image loaded, I'm able to see what it would look like in my telescope's view had I been looking through that particular set of equipment. You can choose additional display options in the lower right hand corner and it will overall known stars, object names, etc into the view. In this final object view screen, the Sky tab, you can see a sky chart of where your object is in the night sky. You can turn on and off planets, stars, galaxies, etc using the display options to the right to fine tune the view and make it easier for you to spot your object in the night sky. I hope this gives you a good indication of the use and benefit of having a detailed planning tool. AstroPlanner is available here and is priced at $45, which doesn't seem like that much for all the features that it offers. Deep sky object, the Crescent Nebula, was imaged over 30 hours on my Explore Scientific FCD100 setup. Using a more advanced program called EKOS. There's a few things that need to be covered here as a starting point. I make some assumptions that you’re familiar with Astronomy, possibly already have a first telescope, and are ready to start taking some images. First you have to make a decision as to whether you want to take photos of the planets and Moon, or if you want to take photos of nebula, star clusters, or galaxies. Basically, the decision between planetary, or deep space objects. These things are not exclusive to each other, and can be done with the same telescope but the results might not be optimal for each choice. Your telescope is probably suited to one or the other. Planetary is fairly straight forward. Large aperture scopes like 6" and above are great for this, and you don't need to have an equatorial mount. Any Alt/Az (Altitude Azimuth) mount will work. A high speed web cam or astro camera and Mac laptop are the only additional entry level hardware requirements. Since most planets are relatively small, the larger the scope, the closer/larger they will look, and the more detail you can get out of your images. Unfortunately planetary processing software is a gap right now on the Mac. You need wavelet processing to get the most detail out of your images, and currently PixInsight is the only real option. There are two other apps that might run on older hardware and operating systems (Lynkeos and Keiths Image stacker), but they're not developed any longer, and crash often on modern hardware. They are however, free applications. For more advanced options, you might switch out Planetary Imager for FireCapture. DSO imaging requires a little more effort. 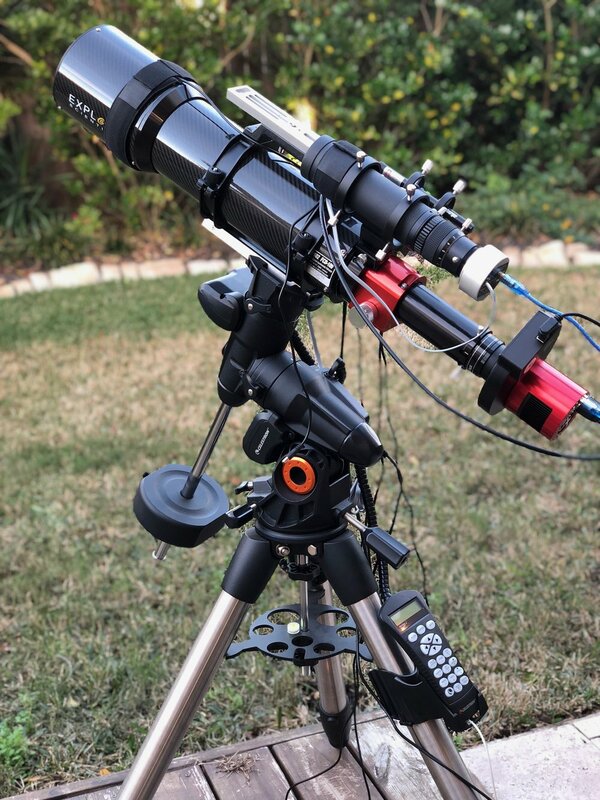 Because this type of imaging focuses on long exposure shots, where tracking your object across the sky accurately is a requirement, you'll need a German Equatorial Mount (GEM). These deep sky objects can vary greatly in size, with a large number of them being bigger than earth's moon in the night sky. Because of this, a large scope isn't a requirement to get started. In fact, it's preferable to start with a smaller scope, like an 80mm refractor. The reason for this is that the larger your scope, the more accurate your tracking needs to be, the better your mount needs to be to handle the weight and accuracy. The difficulty (and cost) goes up exponentially with larger telescopes. So start small. All of the telescopes I use are relatively small (under 6" in size), and all fit on my entry level GEM mount, the Advanced VX by Celestron. Additional requirements are going to be a guiding camera and guide scope. This is essentially a small telescope mounted on top of your main scope, with a guide camera. This camera's job is to watch the star movement, and send corrections to your GEM mount when the mount isn't moving accurately. For entry level equipment, this is a necessity, as these mounts are far from accurate for long exposure imaging. You'll also need a main imaging camera, and your options vary widely here. You have the option of using a DSLR (maybe you have one already in your possession), or a dedicated astrophotography camera that can do color or mono. Mono is a black and white camera, that when combined with color filters, can achieve a higher fidelity color image than a regular color camera can but with more effort and expense. Astro Pixel Processor - Processing software for your images. $50/year, or $125 to purchase outright. For more advanced options you might switch out Astro Imager for EKOS. And Astro Pixel Processor for PixInsight, or Star Tools. I took advantage of a recent sale on ZWO cameras, and sold my old color camera to move into mono imaging. The benefit of using mono is increased resolution and sensitivity in the camera. One shot color cameras have a Bayer matrix over the sensor which is like a screen door with red, green, and blue filters placed over every third pixel. These pixels are merged into a single color photograph in the software after the image is taken. In a mono camera, you shoot black and white, and use a individual color filters over the entire sensor so that all of the sensor is shooting in that one color. After you're done imaging, you merge all the colors into a single higher fidelity image. Below is one of my first attempted color images using LRGB filters (Luminance, Red, Green, and Blue). M42 (Orion Nebula) shot in LRGB on my ES102mm ED telescope.